D = fdesign.interpolator(L) constructs an interpolator filter specification object D with the InterpolationFactor property equal to the positive integer L and the Response property set to 'Nyquist'. 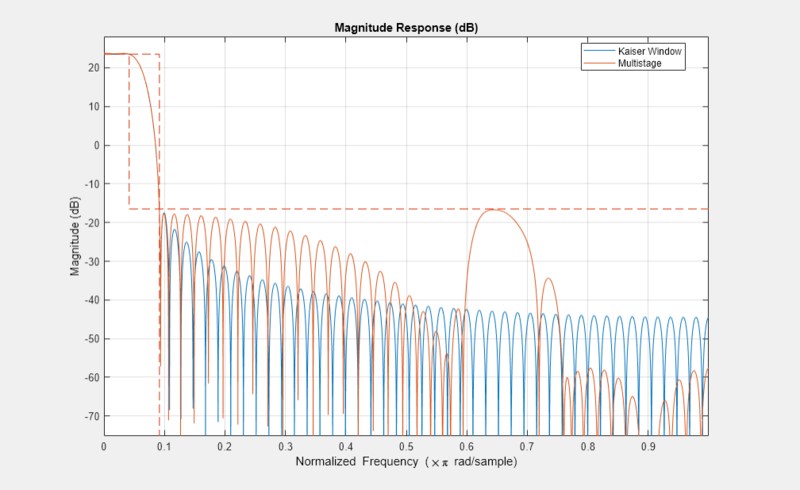 The default values for the transition width and stopband attenuation in the Nyquist design are 0.1π radians/sample and 80 dB. If L is unspecified, L defaults to 2. D = fdesign.interpolator(L,RESPONSE) constructs a interpolator specification object with the interpolation factor L and the 'Response' property set to one of the supported types. D = fdesign.interpolator(L,CICRESPONSE,D) constructs a CIC or CIC compensator interpolator specification object with the interpolation factor, L, and 'Response' property equal to 'CIC' or 'CICCOMP'. D is the differential delay. The differential delay, D, must precede any specification option. D = fdesign.interpolator(L,RESPONSE,spec) constructs object D and sets its Specification property to spec. Entries in the spec represent various filter response features, such as the filter order, that govern the filter design. Valid entries for spec depend on the design type of the specifications object. Because you are designing multirate filters, the specification options available are not the same as the specifications for designing single-rate filters with design methods such as fdesign.lowpass. The options are not case sensitive. The interpolation factor L is not in the specification options. The different filter responses support different specifications. The following table lists the supported response types and specification options. 'Fp,Ast' — Only valid specification. 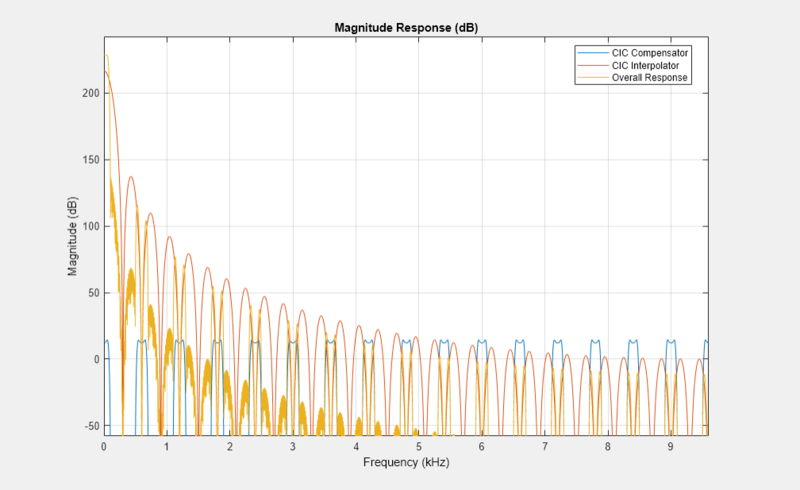 Fp is the passband frequency and Ast is the stopband attenuation in decibels. The specification must be preceded by an integer-valued SamplesPerSymbol. D = fdesign.interpolator(...,spec,specvalue1,specvalue2,...) constructs an object D and sets its specifications at construction time. D = fdesign.interpolator(...,Fs) adds the argument Fs, specified in Hz, to define the sampling frequency to use. In this case, all frequencies in the specifications are in Hz as well. These examples show how to construct interpolating filter specification objects. First, create a default specifications object without using input arguments except for the interpolation factor l.
Now create an object by passing a specification option 'fst1,fp1,fp2,fst2,ast1,ap,ast2' and a design - the resulting object uses default values for all of the filter specifications. You must provide the design input argument when you include a specification. Create another interpolating filter object, passing the specification values to the object rather than accepting the default values for, in this case, fp,fst,ap,ast. Now pass the filter specifications that correspond to the specifications - n,fc,ap,ast. With the specifications object in your workspace, design an interpolator using the equiripple design method. Pass a new specification type for the filter, specifying the filter order. With the specifications object in your workspace, design an interpolator using the multisection design method. In this example, you specify a sampling frequency as the right most input argument. Here, it is set to 1000 Hz. In this, the last example, use the linear option for the filter specification object and specify the stopband ripple attenuation in linear form. Now design a CIC interpolator for a signal sampled at 19200 Hz. Specify the differential delay of 2 and set the attenuation of information beyond 50 Hz to be at least 80 dB. % The filter object sampling frequency is (l x fs) where fs is the sampling frequency of the input signal. dd  = 2;     % Differential delay. fp  = 50;    % Passband of interest. ast = 80;    % Minimum attenuation of alias components in passband. fs  = 600;   % Sampling frequency for input signal. l   = 32;    % Interpolation factor. hm = design(d,'SystemObject',true);  %Use the default design method. This next example results in a minimum-order CIC compensator that interpolates by 4 and compensates for the droop in the passband for the CIC filter hm from the previous example. hmc is designed to compensate for hm. To see the effect of the compensating CIC filter, use fvtool to analyze both filters individually and include the compound filter response by cascading hm and hmc. fvtool returns with this plot. For the third example, use fdesign.interpolator to design a minimum-order Nyquist interpolator that uses a Kaiser window. 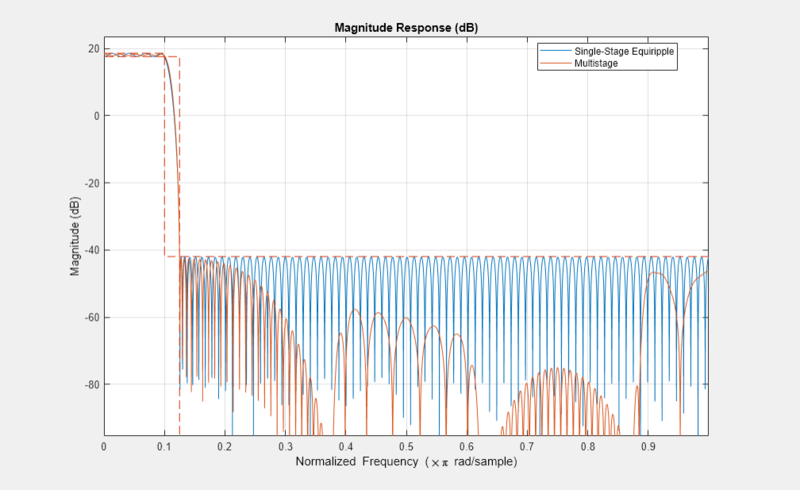 For comparison, design a multistage interpolator as well and compare the responses. l   = 15;   % Set the interpolation factor and the Nyquist band. tw  = 0.05; % Specify the normalized transition width. ast = 40;   % Set the minimum stopband attenuation in dB. hm2 = design(d,'multistage','SystemObject',true); % Design the multistage interpolator. Design a lowpass interpolator for an interpolation factor of 8. Compare the single-stage equiripple design to a multistage design with the same interpolation factor. l = 8; % Interpolation factor. % Use halfband filters whenever possible.